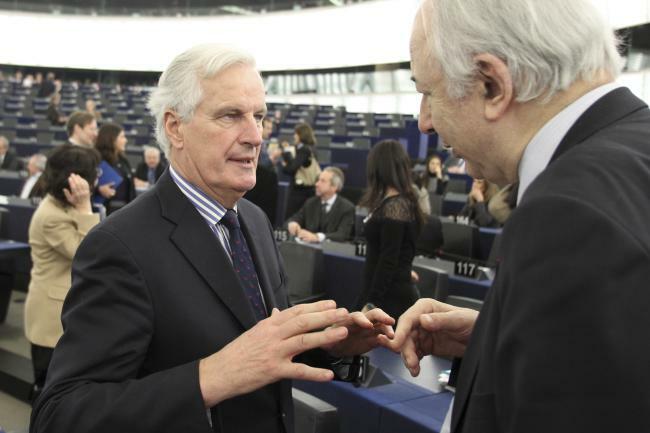 Michel Barnier, Commissioner responsible for Internal Market and Services (on the left). Participation of the European Commission College at the European Parliament plenary session of 04-07/02/13. (EC Audiovisual Services). Last week the European Central Bank issued a press release welcoming the EU Commission’s initiative to regulate the banking industry’s setting of benchmark interest rates, like the Euribor. Interbank interest rate benchmarks are systemic and vital to the entire financial system. Any failures may cause losses for investors, distort the real economy and undermine market confidence. Financial contracts which worth many trillions are being concluded every year, based on those benchmark interest rates. The basic points of ECB’s statement are quoted here: “The Governing Council of the European Central Bank welcomes the European Commission’s intention to introduce further legislation regulating systemically important reference rates. In its response to the Commission’s consultation on the regulation of indices, the Eurosystem has called for the regulation of systemically important reference rates, with a view to enhancing the governance of all key processes surrounding the rate-setting calculation and increasing market’s confidence in the rates”. Unfortunately, this Commission’s initiative comes too late and seems too weak. Already the banks have had the time to also usurp this market by organising criminal rings, which were setting up for years those benchmark rates according to their “needs”. Now one after the other those major banks agree with the authorities to pay some hundred millions in fines, after having gained trillions out of the “ring”. Apart from that the American authorities are also conducting criminal investigations against some banks. Let’s follow the facts from the beginning. After the great credit crunch of the Western financial system in 2008 came the Libor setting scandal, depriving the banking industry from its last drops of confidence. Regulators in the US and Europe gloriously failed to set new rules and restrictions on lenders, thus letting them free to continue doing whatever they did and brought the Atlantic economy to its knees. Bank failures continue to this date in the Eurozone, forcing governments and the European Central Bank to underwrite their losses, using valuable resources taken away from taxpayers and the society as a whole. Hundreds of billions were spent to keep Eurozone banks alive and safeguard peoples’ savings. According to a European Commission estimate the banking industry has been subsidised so far with €4.5 trillion of public money. At the same time the real economy and the real people were submitted to draconian austerity programmes to keep Eurozone alive and save the value of the euro. The Commission is aiming to present its proposal on benchmarks in the second quarter of 2013 and I expect that proposal to include the power to impose mandatory submissions for systemic benchmarks such as Euribor. To ensure clarity, my services will ask the European Securities and Markets Authority (ESMA) and the European Banking Authority (EBA) to start preparatory work aimed at identifying banks in view of their involvement in interbank lending markets which should be subject to a mandatory participation in benchmark setting”. Once again governments and central banks are well behind the curve, having allowed the financial industry to spin around the globe other people’s money. Evidently for as long as this spinning leaves hefty profits, all is well. When the risky bets turn sour and the bubbles burst, governments and central banks run to keep the system alive by using the sweat of the real economy. This is exactly what is happening again. The EU Commission and the ECB are taking measures just to keep the system alive without touching the real causes. It’s like trying to cure cancer with aspirin.